“Today, Jay Dardenne became the Nick Saban of Louisiana Politics," Republican Party of Louisiana Chairman Roger Villere said. "After decades of using the Republican Party and its members for his benefit, Jay has decided to end his political career by supporting a candidate who opposes every public policy position that he once espoused. We have a clear choice between John Bel Edwards, a liberal legislator who has a 29 percent lifetime record with Louisiana business or a proven conservative in David Vitter. It is sad that Jay allowed his personal feelings to cause him to betray his party and state. 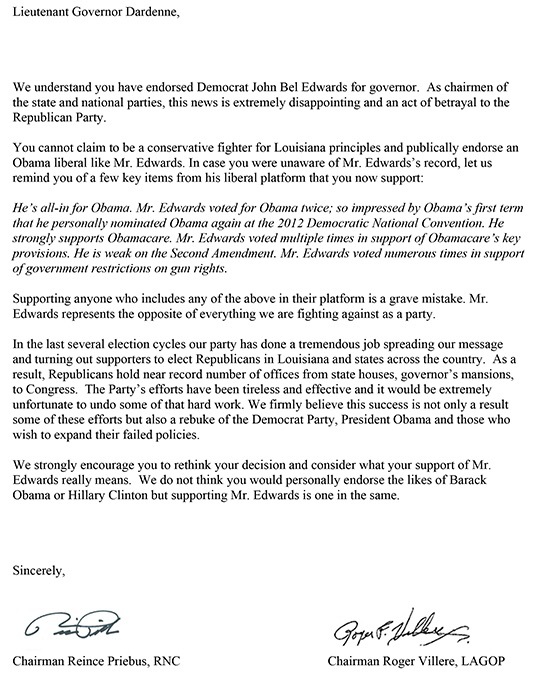 The Republican Party stands firmly behind Senator Vitter, " Villere concluded. Posted on November 5, 2015 by Christopher J. Gary and filed under John Bel Edwards, Louisiana, Jay Dardenne, David Vitter and tagged David Vitter Jay Dardenne Louisiana LAGOV John Bel Edwards.